Treasures My Husband Hates: It feels good to purge a little. It feels good to purge a little. I'm so happy! Since having this obsession over pyrex I've ended up with doubles. And ended up with some I ask myself why I have. So in my quest to be a littlest better about my spending and space I have went through all my stuff and listed it for sale on Craigslist. I also hope it will fund the new beauties soon to be mine. So let's say a fair well to all these guys. They all got a new home. I'm sharing the love. See I'm not a hoarder. 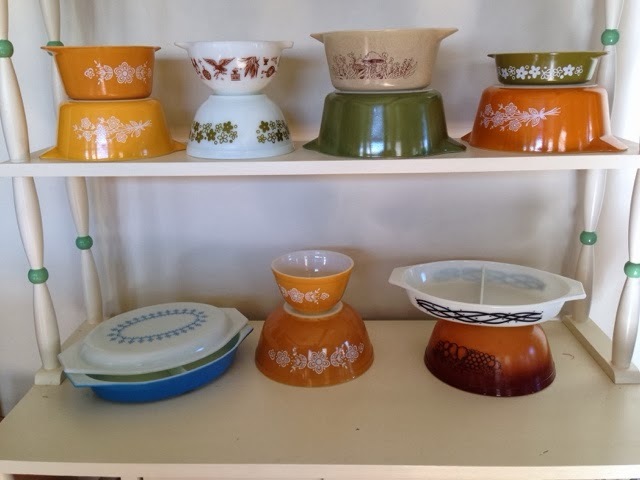 Sharing the love is ALWAYS good, and it makes for good Pyrex Karma! It's a good thing you had it all with you! Haha, if we weren't on opposite coasts, I would buy that barbed wire from you. That is the only DD I am still looking for! I'm a treasure hunter, mother to Treasure Hunter Mini(THM) and Wife to Treasure Hunter Hater (THH) I dig through trash, scour thrift stores, go through friends and families belongings and always come home with something of a treasure. You'll never meet anyone like me, I can guarantee it! Corning Military Bowls & misc Pyrex!